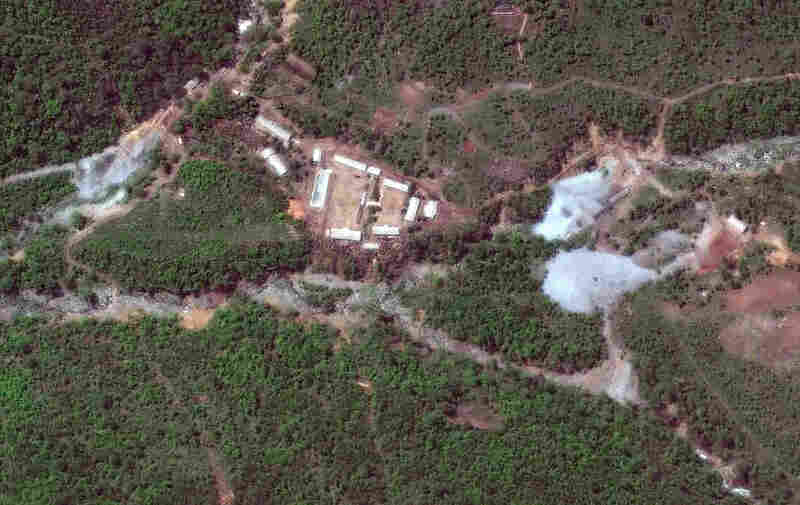 North Korea Demolishes Its Punggye-ri Nuclear Test Site : Parallels Journalists observed as North Korea blew up tunnels it uses for nuclear testing. But experts say it was mostly for show, and closing the site will have little impact on the nation's capabilities. A satellite photo of the Punggye-ri nuclear test site in North Korea on Wednesday. North Korea closed its nuclear test site in spectacular fashion Thursday, blasting the site in what one observer described as a "huge explosion." Within hours of the North's demolition of the site, President Trump announced he was canceling a much-anticipated summit between the U.S. and North Korea. "Sadly, based on the tremendous anger and open hostility displayed in your most recent statement, I feel it is inappropriate, at this time , to have this long planned meeting," the president wrote in a letter to North Korean leader Kim Jong Un. International media were assembled in view of the Punggye-ri test site, about 500 meters (1,640 feet) away, according to Sky. North Korea claims it tested six underground nuclear devices at the facility. "You could feel it. Dust came at you, the heat came at you," reported Sky News' Asia Correspondent Tom Cheshire, a British broadcaster who was invited to the demolition. But longtime watchers of North Korea's nuclear program say the closing of the site will have little impact on the nation's capabilities. "What does it actually mean in the long term? Probably not that much, unfortunately," says Melissa Hanham, a senior researcher with the Middlebury Institute of International Studies in Monterey, Calif.
North Korea has already conducted six nuclear tests at the site, the last of which was considered highly successful. Hanham says at this stage, it's not clear that North Korea needs to continue testing its weapons at Punggye-ri. By destroying it, "They're giving away the least useful part of their nuclear program," she says. Punggye-ri is located in the remote, mountainous northeastern section of the country. The test site is believed to have been established in the early 2000s, and it became widely known following the North's first nuclear test in 2006. The smattering of journalists from the U.S., U.K., South Korea, China and Russia took a reported 20-hour journey by train and bus from Wonsan, on North Korea's east coast, to get to Punggye-ri for the nuclear site dismantlement. In addition to being remote, experts say Punggye-ri is an ideal test site. "From a geologic perspective, it's a really good choice," says Frank Pabian, an imagery analyst at 38 North with a long background in studying nuclear testing. Most of the test tunnels lie under Mount Mantap, a granite mountain that is perfect for containing powerful nuclear explosions. 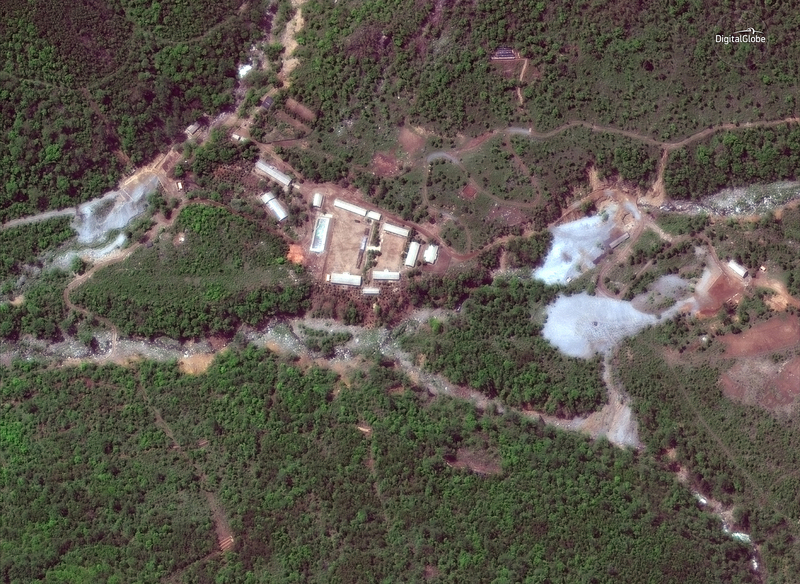 North Korea's most recent test, in September of last year, was so large that experts have speculated it may have collapsed part of the primary tunnel at Punggye-ri. Some analysts think that the explosion might have rendered the entire site unusable, but Pabian doubts that's the case. Immediately after the test, he notes, satellite images revealed the North stepped up digging in another tunnel, the so-called West Portal. "They were going gangbusters," Pabian says, until work stopped abruptly this spring. Scientists recently estimated that last fall's test produced a yield between 120 and 304 kilotons of TNT equivalent — on a par with many weapons in the current U.S. nuclear arsenal. "That's pretty impressive," Pabian says. "You don't need to do a whole lot more if you can do that — at least, not anytime soon." And Hanham says North Korea could probably get the test site working quickly again, if it needed to. In 2008, it demolished the cooling tower for its main reactor at a nuclear complex known as Yongbyon. But a few years later, when disarmament talks broke down, it restarted the reactor, using cooling water from a nearby river. While demolishing the Punggye-ri test tunnels may not be much of a setback for the North's nuclear program, it does send a clear message to the world. North Korea committed to this gesture following the April 27 inter-Korean summit, where the leaders of the two Koreas signed a joint agreement calling for a "nuclear-free Korean Peninsula." 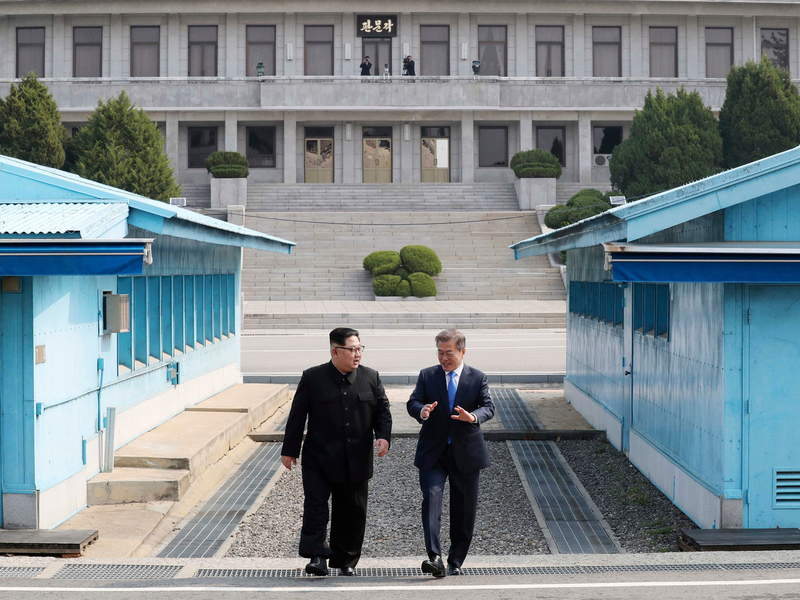 Denuclearization was discussed in April at the inter-Korean summit between North Korean leader Kim Jong Un (left) and South Korean President Moon Jae-in. "If we maintain frequent meetings and build trust with the United States and receive promises for an end to the war and a non-aggression treaty, then why would we need to live in difficulty by keeping our nuclear weapons?" Kim Jong Un said during the summit to South Korea's President Moon Jae-in. That quote was relayed to the press by Yoon Young-chan, a spokesman for Moon. The weekend after the summit, it was the Blue House in South Korea that announced North Korea would invite foreign observers to Punggye-ri. "There are multiple audiences they are targeting," says Lisa Collins, a Korea expert at the Center for Strategic and International Studies. "I think one is the United States, the other is probably China. I'm sure they're also hoping to convince South Korea that they're serious about creating conditions for peace on the Korean Peninsula." However, letting in a smattering of foreign journalists is different from North Korea's original pledge following the April 27 summit, in which Pyongyang announced it would let in international journalists as well as nuclear experts to observe the dismantling of its test site. Journalists on this week's trip report no such experts joined them for the visible gesture put on by Kim. "It would have been a greater indicator of their intention to dismantle their program if they had invited nuclear experts," Collins says. She adds that although both sides agree that the Korean Peninsula should become "denuclearized," they remain far apart on what that word actually means. The U.S. wants North Korea to unilaterally hand over its nuclear weapons. But North Korea likely has a laundry list of prerequisites, including the drawing down of U.S. troop levels on the Korean Peninsula, a cessation of joint military exercises and delivery of foreign aid. Those divisions became increasingly clear in recent days, as the rhetoric escalated between U.S. and North Korean officials. President Trump's decision to call off the summit came in the wake of a North Korean statement calling remarks made by Vice President Pence "ignorant and stupid." That in turn was in response to a Fox News interview in which the vice president warned that North Korea could end up like Libya, which was bombed by NATO forces even after surrendering its nuclear program. Collins says that she hopes the cancellation of the summit will not cause the rhetoric between the two nations to spiral. "I would hope that there would not be a return to talk about military options," she says. "I think that would be pretty disastrous." Se Eun Gong contributed to this story.